New MP3, album title, tourdates, HOLY CRAP!! Lots of new stuff announced today! And (fourth) here are a bunch of new tourdates! We're all super excited for all these new things. Hope you are too! This is simply awesome! I've been looking forward to new Trapper all spring. Just a little bummed that there are no FL dates for the tour. Super psyched for all the news rolling in lately! I love the months prior to a release, when news slowly turns from a trickle into a flood. Headrush. And the new song is absolutely gorgeous. And 'Destroyer of the Void' is a mega-badass name, love it. Thanks Matt! Long awaited news at last. Love the new tune. It's not drowned out with Reverb like many other bands. Pure, simple, and beautiful, the BT style. The link to the MP3 is a dead end. I'm really looking forward to hearing it. I hope you guys can get it back up soon. Woops, sorry about that. Fixed! Hey Blitzface, thanks for the props and the capital "R" on Reverb! I'm glad you appreciate the special BT style—I've been reading this novel based in medieval Japan where all the ronin and samurai are always dreaming of creating their own distinctive style, and your post made me think maybe Earley has done just that. The Musashi of Indie Music? great news guys ! can't wait to hear it all ! Can't wait! Any idea when the location for the Cincy date will be determined? Is it just me, or are Sasquatch and Lolla looking sorta likely based on those dates? I'm glad they're coming to Spokane this time. Now I don't have to drive down to Kennewick! But I'm in Kennewick! Now I have to drive up to Spokane. Super jazzed about this album. Love how stripped down the new tune is. Atlanta the day after its release, what!? Oh and if any trapper dudes are reading this, make sure you go to "Kulminator" when you're in Antwerp. It's the #1 best beer bar in the world...for real. aspen eh? right near me ye olde bday too. good nudes matt, thanks! Spokane! Now that I can do. Hope we can give the trappers a royal welcome. The Knitting Factory is a great venue. Thanks for the Pennsylvania love.....3 dates!! Lancaster, PA loving it!!!!! June 8th new album....June 18th great live show!!! I love things to look forward to. So excited for the new album and the St. Louis & KC tourdates! Thanks for remembering the midwest! Are the Cincy and St. Louis shows not on the Tour page because you guys are still ironing out the details? What are the chances of an album stream on NPR or something before the release? I am very excited for BT's 2010! Oh yeah, we'll add those dates as soon as we've got a venue. I'm not sure what Sub Pop is planning on lining up as far as an advance stream, but those things seem fairly standard these days, so I'd say the odds are good. June 8th new album release by BT and Grace Potter and the Nocturnals = whoo-hooo!!!!! June is gonna be a sweet month!!!!! Lollapalooza 2010!!! Yea! 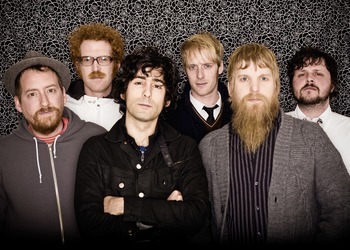 Blitzen Trapper!! Yes, Lollapalooza! xnotxitx, I've been biting my tongue since you posted, but now it's revealed: they're totally playing Chicago! I believe the Moondoggies are opening a number of those upcoming dates - don't miss them, they're fantastic! I just saw you guys are playing Newport Folk Festival in RI at the end of July before going to Montreal -- any chance of playing in Boston or Burlington VT or anywhere in New England at the end of July? I'm dying to be able to see you guys live this summer. when do tickets go on sale for 6/14? Is the Albuquerque show on 6/27 happening? It's listed here but not on your tour page. Please, Please, Please don't skip over NM!!! man, the new album is really awesome. nice job! can't wait til the vinyl comes out. Heaven and Earth are mine says I......I can't blinkin' wait says I! The new album is HUGELY disappointing! Hey WaaHappened, you're a douche. Sorry winterchrome, just how I feel. After some of the gems on Wild Mountain Nation and Furr I wasn't suspecting a semi-disco"esque" soft rock album. Blitzen Trapper had become one of my favorite new bands, but this album is a very large let down. You're certainly welcome to your opinion, but however you feel about it, unless you recieved a legit copy to review professionally, it may not be the most kosher thing to post on a band's official forum your opinions about an album that isn't released for another month. come to texas? please? preferably Austin or environs? I hope you guys will be at ACL this year, but come to texas aside from ACL. We want you! I really like what I've heard of the new album, but I think WaaHappened has a good point to the extent he recognizes BT has set a very high bar for themselves. I'm going to wait until I hear a full, official (and purchased) release before forming any opinions though. hey everybody, we're over here in Antwerpen Vlaandaaren on a short lil run before the Big Haul around the states. it's been fun working out the new songs some in front of unsuspecting audiences. seems like people over here are really receptive to the Destroyer material, we'll see how it goes back home. But from the chatter online it seems like there's some who wish we'd gone back more in the WMN vein for this new one, that makes sense, in North America that record was the first anyone had ever heard of us and lots of people probably think it was our first release. but of course we were doing prog/folk/pop junk for a long time before that. it just goes to show that first impressions really do make a difference in how folks receive/perceive. in Europe people are just hearing about us for the first time so only the very hippest 'early BT adopters' over here take any issue with Destroyer's 'feel' or 'genre'. anyhow, it's good to have dissenting opinions on here, I guess I'd feel pretty excited if folks used the forum to get into how pop media works/synergizes with people's expectations/hopes/desires/identities. This is fascinating stuff I think. There's more than meets the eye. a toast to constantly growing and only getting better ! "How you gonna know what the wind is whisperin' now? How you gonna know unless you leave this world somehow?" I’m gonna take a bit of a different tac here in re: to what Marty spoke to above, nearly everyone acts as though the assumption that human beings are only thinking animals is the whole truth, more importantly, we’re ALSO Spiritual Beings, living in a un-balanced, disharmonious and radically marketing-programmed world. While it is true we can be reduced to being competitive animals bent on getting what we want at all costs and to 'winning the competitive game,' I think there is a lie being told here, that is at the root of modern societies pervasive media playing to peoples lower, animal-like fears/desires/identities/addictions etc. So to me, the real problem is the inner connection in most cases has been lost for most people or become latent in people inside, and outside in the world, it has generated as a consequence the world we see, where as Marty nails it, there is so much below the surface appearance of things. Most people cannot sit still for more than 5 minutes before they are driven out of themselves by stimulation, by the surface intellect’s wandering thoughts and fears, etc. I feel the lie that is taboo to speak of is that human beings aren’t just ‘dog eat dog’ beasts out to kill or be killed, no. Have you ever encountered one infant or young child who was born with innate hate, fear, and a me-first selfishness--like the apes we’re wrongly told we're direct descendants of? From experience, I have found out the hard way, that we are all born with 2 minds: the deeper spiritual mind, the first mind, that contains the seed of who we are and why we’re here, and whom we're here to meet (purpose, meaning, and direction). Then, there is the second, surface-intellect that ‘thinks’ like an animal to secure its survival, it advantage, and its needed resources for life(competition). So we have one mind that thinks and the deeper mind that Knows, but many people in modern societies have lost touch with that deeper mind that we were born with and seldom is it listened to or heeded or consulted in big decisions. People today are focused solely on the surface mind, they are very rushed, they’re very focused on busyness/stimulation, their tasks, their ambitions, and no one is really listening to the voice of conscience, the voice of Spirit, the true inner voice within us all. And as a result no one really is paying attention, to what is going on in the world, and the direct response Spirit is giving them inside in relationship to what is going on in the world. Much of our natural wariness, patience and our greater innate powers of discernment and inner guidance has been lost or become latent among modern industrialized peoples. Yet we were more gifted when we were less distracted, when we were more focused on life as it is, more technologically primitive and when we lived simple lives in balance with nature and the world, when we lived closer to the earth, our communities, and closer to each other and closer to ourselves as we were born to be. Now people depend upon experts, upon their technology, upon science, and upon the puppet corp media to tell us what is true and what is right. You used to go to your clergy to figure out what was true now you go to your science. Our god has become technology and this has generated great imbalance, mis-use and abuse of our only home; 200 species go extinct per day, everyday now. We are entering into the 6th great extinction event in history, this will probably be the first one that is predominantly human-created. http://whyarethingsfalling.blip.tv/#1325125 background on what we’re facing in clips from a comprehensive new documentary called What a Way to Go that is an incredible doc to watch. We're creating a situation where we're going to have no choice but to wake up and face facts on, we will be forced to change or change will be forced upon us by nature, same as always, in any community in nature and history this has occured. I think as things change inside people and as things change in the world, all great art, literature, and science that is real and meaningful must change and has changed with the world, for the truth of our real spiritual nature must be given new expression to suit new times. No one is listening inside anymore, and why should they? Corp Fake Culture certainly isn't encouraging that (see below), nor are the seminaries, the higher education institutions, or the churches and western spiritualities, for the most part. Really, why shouldn't they is the question. If people are not listening inside to what Spirit is indicating--no middleman required--then they will just follow their group, their families, their friends, their leader, their culture, all the while missing the real inner guidance that resides within Spirit inside all of us, waiting to be discovered and followed. Few talk about this in the West, yet in indigenous cultures and spiritualities, including our own North American Native American spiritualities, this deeper mind of Spirit was well known and cultivated through daily practice for millenia. So much so that seers and shamans were often recognized at early ages and given special instruction in certain tribes. These people (see links below) have prophecies that have helped guide and lead them, for a long time, many of these of different Elders are not coming true. Unlike our forefathers, and the indigenous peoples we've displaced and decimated, in the West few if any really have much of a connection to nature anymore, especially in most urban areas. Because so many people cannot hear the real inner communication that is going on inside there is hardly anyone has real original thinking, real revelatory breakthroughs, and its seems so few now seek to establish genuine collaborative relationships of great benefit to the planet and humanity. its easy to see something that is true it shows itself with natural real messages of growing, changing, and meaningful achievement through devotion to one’s real inner self, to one’s real values they innately feel inside and to one’s contribution of their gifts to their community (among others). In addition, most people are not able to be with their experience and to be with how they feel at a deeper level regarding what they come across in their daily experiences. They are too rushed, too stimulated by the constant noise, music, talk, media, activities, tasks, and the vagaries of daily life. (I am certainly guilty of all of these myself, so its is struggle at first, but after a while, through inner listening, you are actually able to 'click out of' the surface mind and its incessant noise, judgment, speculation, and fear and scheming nearly immediately. And what you find below the surface, is a vast and immense silent space within you where you can go for counsel and rejuvenation. This is the real temple within.) Most people cannot sit still for more than 5 minutes before they are driven out of themselves by stimulation, by the surface intellect’s wandering thoughts and fears, etc. There is a whole lot of talking in the world, but not a lot of listening. This band's lyrics speak of listening inside, to the deeper voice of conscience, the voice of Spirit that is nearly constantly communicating to all of us. Since I'm not concise here (sorry), check out The Tao Te Ching, The Dhammapada, which are concise & laden with what I'm attempting to say, in a earnest attempt. And by the way, the new album is not, hugely disappointing. I find it refreshing, new, original, 'fantastical', and wonderful to listen to while out. If y'all wanna put out another EP this year, I'm buying that bad boy too. Keep them coming Earley and BT, I'll keep showing up and getting your product and shows. People's expectations are different that is all, they want their expectation, they do not want reality, they want the band to use ESP somehow to 'cow' to what they prefer. Now. I understand change in art, science, nature, the economy, climate change, resource depletion, and change in life is hard, and who am I to say I'm not stubborn in my mind's thoughts as well, and that I don't fight it? Because I do. but, it is what it is y'all. You think this stuff is different, go back and listen to the former BT work under their alter ego name years ago, and I love that stuff. whats with the fun double-spacing at the beginning of every post and after every 'hard return' key pressing? perhaps unless you purposely delete it out? ...hmmm, yeah, i guess i was 'expecting' it to be like the old forum manager thingymajig. fooled again.